We got there too late, and the store was closed for the day. Rats! It looks like a cute shop, here’s a picture. We stopped to have dinner with friends at a newish restaurant, The Lucky Moose Bar & Grill in Walker. It’s a cute place and the food was tasty. 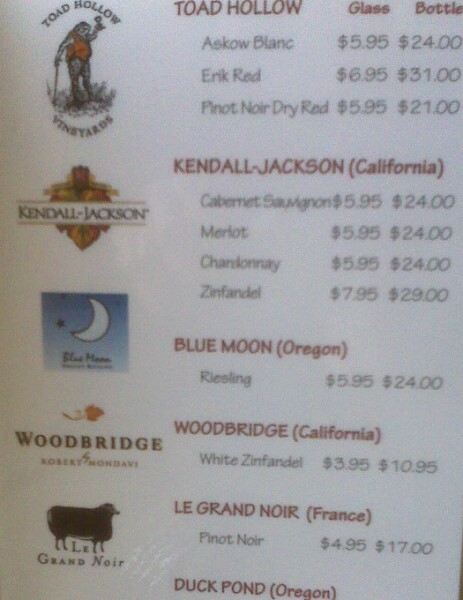 The wine list was in front of my seat, so I snapped a couple pictures of the amusing names before we left. Three Blind Moose not only has a cute logo, they have a cute website. And what knitter couldn’t resist a wine with a sheepy logo (Le Grand Noir)? Although I didn’t make any yarny purchases that weekend, I did pick up two knitting pattern booklets self-published by a local knitter (Cass Lake). 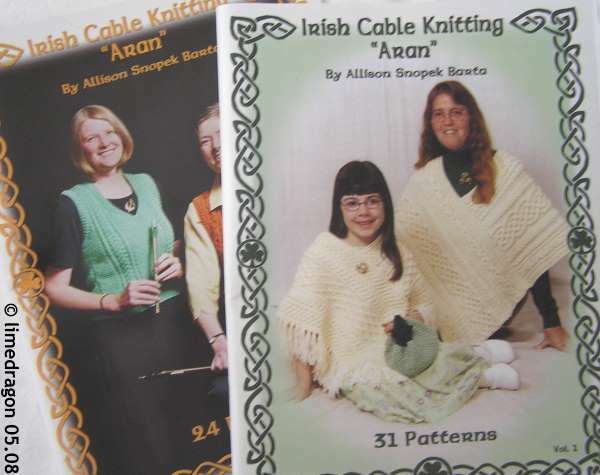 As you can see, both volumes focus on Aran work. They contain a variety of cables that can be used in scarves, headbands, gift bags, afghans, vests, or shawls. What I liked best were these bed socks resembling Irish step dance shoes (in Vol. 2). So many shops I have never visited! Those bed socks are a hoot! I love Aran work. I wish I could do more of it! The names of those wines are too cute! 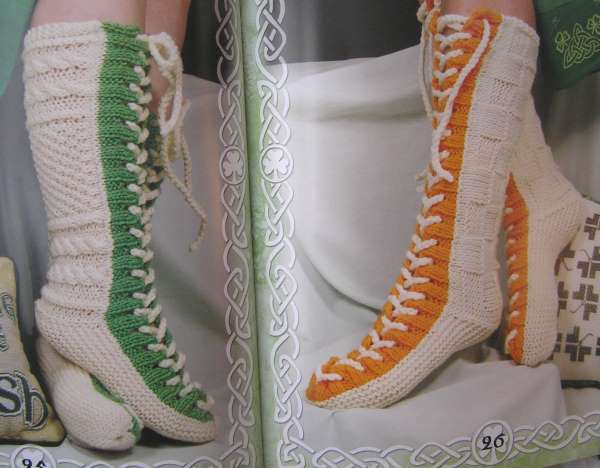 Hehe :) I bet you wanted to get your needles out straight away to knit those! My niece would LOVE those bedsocks, therefore she must never see them. 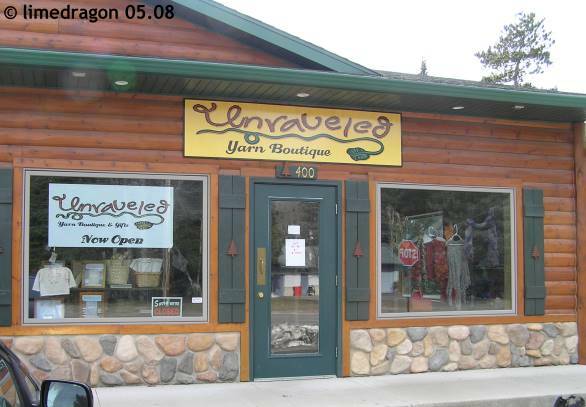 The Unraveled shop does look charming! 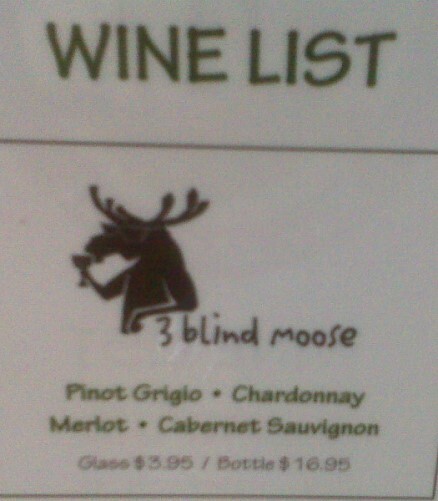 3 Blind Moose? Did you try their Pinot Grigio? Because for some reason, it sounds like it must be fabulous. That’s one cool sock. Reminds me of ice skating. If you get to Park Rapids, check out Monica’s (Monika’s? don’t remember) Great selection and excellent prices. Kewl socks, which will you knit first?